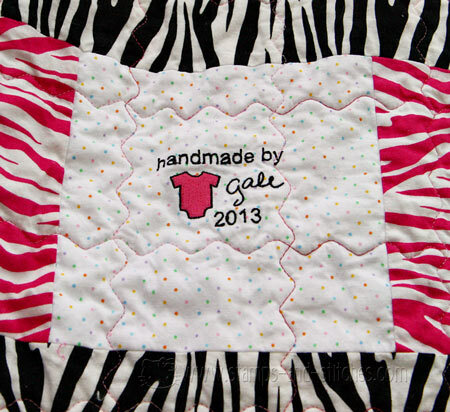 A family member told us last year that she was expecting, so of course, a baby quilt and some baby gear were put on my project list. I found out through her pinterest page that she liked zebra stripes and black and pink, and eventually, it was revealed that they were expecting a little girl. 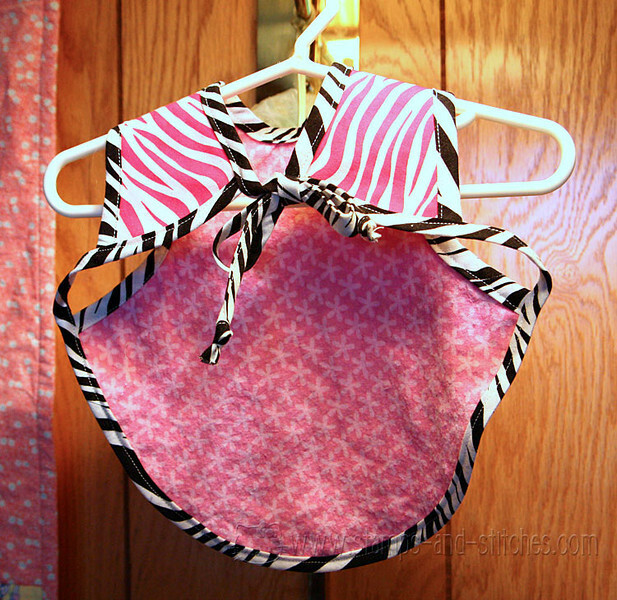 So I made her a few zebra themed things. 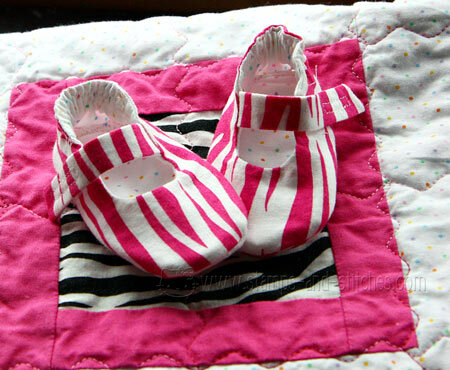 A quilt, a bib, some burp cloths, some tiny shoes, and of course, a card (not zebra themed). I've had these things done for a couple of weeks now but was waiting for the baby to arrive to post them. She had her Friday night! A perfect and beautiful little girl. My usual curved corners-here's a close-up. I did my binding a little differently this time. 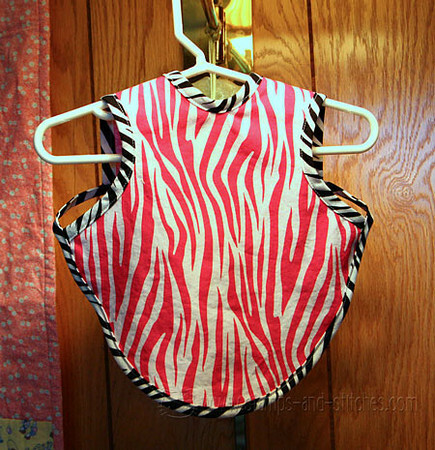 Normally I sew it to the back, fold it to the front, and zig zag the edge-not really caring how it looks on the back. This time I accepted a challenge from my sister and sewed it to the front, folded it to the back, and sewed in the ditch on the front, catching the back. It was a little slower but I like how it turned out! a close-up of the label, which I made on my new embroidery machine using EQ Stitch to trace my signature. You can also see the serpentine stitch I used for the quilting. I love this stitch and learned how to program it into my Janome 6600 on the Janome 6500/6600 yahoo group. 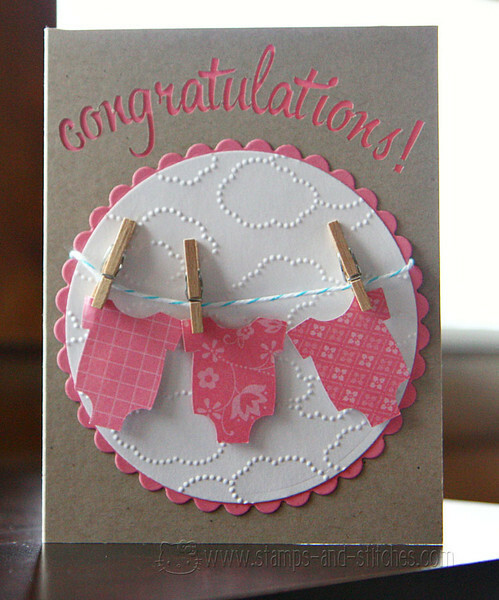 And the card-another clothespin card. I've been a Craftsy member and class-taker for a while now, so when the people at Craftsy asked me if I wanted to review a quilting class, I jumped on the opportunity! What's more, the class is one I probably would not have automatically picked so it was nice to be able to take it. The class they provided is called Precision Piecing. Since I generally go for quick and easy, I avoid anything requiring precision. The main reason is that the precision never happens. Well it turns out I wasn't doing all I could to get precise piecing. The class, which is led by Norah McMeeking, was pretty great. 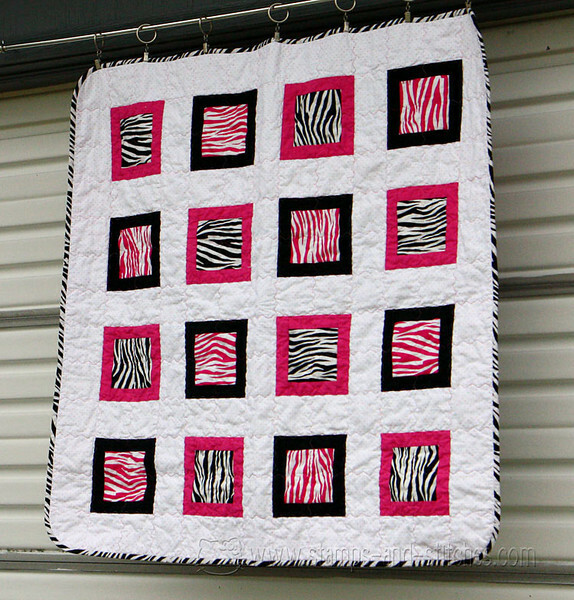 I learned several methods to get more precise in my piecing, some of which I never would have even thought about. Yes, some take a little more work but the end result is worth it. There are three amazing quilts that are taught in this class. Two are, admittedly, way beyond my comfort level right now. 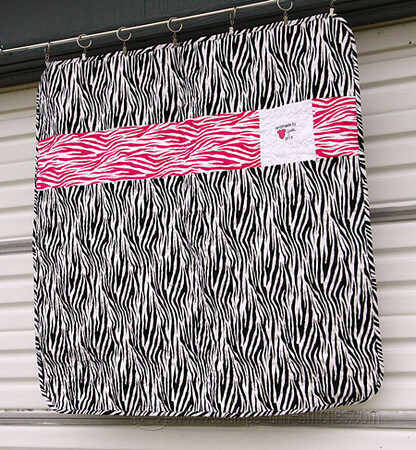 But there is a beautiful paper pieced stained glass quilt that I am going to try. One thing I love about the classes at Craftsy is that you can take notes during the class. This way if there's something you want to be sure to remember, you don't have to go through the video and try to find it again. There is a section in each class to find class notes you've taken. Another great thing is that they have a chat type feature where you can ask questions right during the video lesson, and usually, the class instructor will answer. Sometimes other people will also answer, which is helpful if the instructor is busy, or if there are different ways of solving a problem or answering a question. When you click on a question or the replies, the video will pause and then restart when you click back to the list of questions. Other handy features are a small message board for each class, a section for finished project photos, user reviews, and a list of materials. Often, there are templates or other printables you can download. 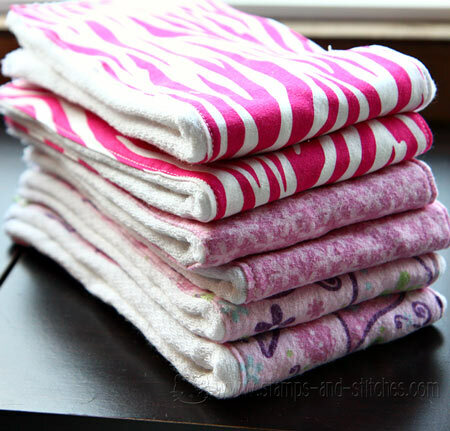 And the best part-Craftsy classes you've bought are available forever. If you take a year to get one watched (guilty as charged!) or need to refer back in the future, your materials are still there. So that's the good. Now the bad. I've noticed this about a lot of their classes. Sometimes they could take a lot less time to show something. They might do the same block or seam several times and I feel like they could speed that up or even cut to the next step. I get distracted easily and this is usually when it happens with these classes. Luckily I can rewatch any time in case I miss something important. Also, while they have an iPhone and iPad app, I have an Android phone and Android tablet with no plans to ever switch, so I wish they would release an Android version. And now, something for you! 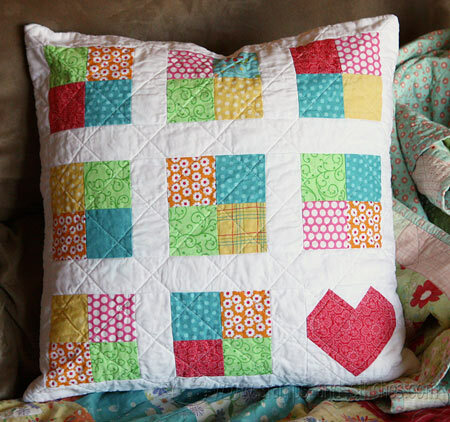 Craftsy has provided me with a special link for 50% off the Precision Piecing class. If you'd like to try this class, just click here to get it at a great discount! Also, be sure to sign up for their newsletter-they have sales often and you can be notified of new classes. And it's not just for quilters. Craftsy has lots of non-sewing classes too. Cooking and cake decorating, home and garden, paper crafts, knitting, crocheting and more. 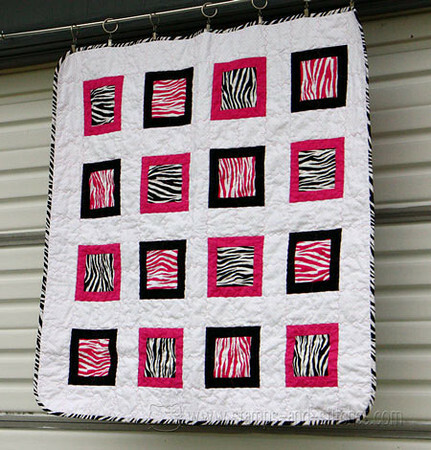 I've only taken quilting classes but I'd like to try some of the others someday. 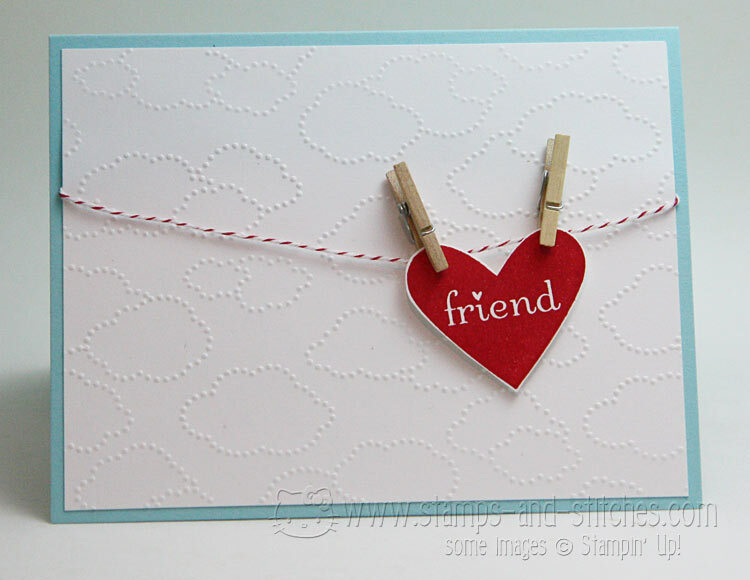 So here's that link again: click here to get the Precision Piecing class 50% off! !